The information superhighway will, according to all the hype, change the way we work and play. In truth, the information highway isn’t all that “super” to day; you can find far higher- quality information at any well- stocked public library. But if you have both patience and determination, you can get some interesting nuggets about music and A/V gear delivered to your computer screen via online services. And the best of today’s online musical offerings provide a glimpse of what the future might bring. To tap into an online service, you’ll need a Windows-equipped or Macintosh computer, a fast modem at least 9,600 bits per second (bps) but preferably 28,800 bps and a phone line. To listen to music on a Windows computer, you also need a sound card and external speakers. You don’t need any peripherals to play mono sound on a Mac, but you’ll need external speakers for stereo with most models. Among the many online choices, the World Wide Web portion of the Internet offers the most visually appealing and interactive information. On the Web you can access colorful screens that resemble magazine pages complete with text, graphics, and pictures. You can click on highlighted text or graphical icons to listen to mu sic, download a file into your computer, or jump to another page some where else in the Web. The way information is served up by the three major commercial online services is less appealing. America Online is able to display one picture with text, Prodigy can only manage stick drawings with text, and CompuServe is unable to show graphics and text at the same time. You can’t hear sound or watch a video clip over the commercial services unless you search through a sort of file cabinet, select a file, download it, and play the file using a separate piece of sound software. The commercial online services are organized somewhat like a newsstand, where the main offerings are prepared by a variety of established publishers, or “information providers.” By contrast, the Internet started out as a non commercial information network of computers around the world; although many major music publishers put in formation on the Internet, a far larger portion of Internet offerings comes from individuals and small groups. The commercial services decide who can publish in their domains, but any one can put information up on the Internet. Thus, small publishers of alter native music have the same access to the Web as big record labels. As a result, the Internet offers far more variety and energy than the commercial online services. But since there are no editors shaping Internet material, someone with nothing to say can publish just as easily as a skilled writer or designer with insight and style. The commercial services have editors in their main areas. The vast outpouring of Web pages in recent months makes finding the good stuff both difficult and tedious. For example, more than 6,000 Web pages deal with music in some way. And flipping through pages online is far slower than browsing through a magazine or book. AOL and CompuServe offer several hundred screens on music and audio; Prodigy has only a few dozen. Because of the wide interest in the Internet and particularly the Web, the three big commercial ser vices now offer access to Web pages in addition to their own material. As for pricing, AOL and Prodigy charge $2.95 an hour, CompuServe $4.80 an hour. For Web access you can also connect via an independent Internet provider, typically for $1 to $2 an hour. In addition, you have to pay for the phone call. In most cities you can call a local number, so if you have flat-rate service you don’t pay extra. But if you live away from an urban area, the phone charges can be higher than the connection costs. The commercial services and the Internet providers will furnish software when you subscribe. For a good introduction to the complexities of the Internet, I recommend The Internet Starter Kit by Adam Engst (Hayden Books), which comes in both Windows and Macintosh editions and includes a disk of Internet-connection software. 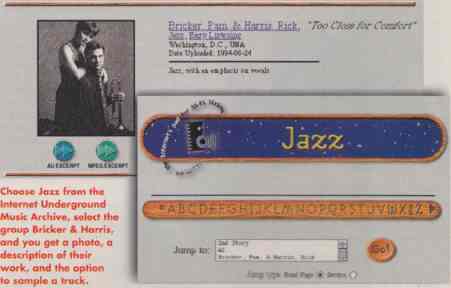 Above: Choose Jazz from the Internet Underground Music Archive, select the group Bricker & Harris, and you get a photo, a description of their work, and the option to sample a track. Alternative music gets exposure on the Web through the Internet Under ground Music Archive (www.iuma.com). More than 500 acts have a page with a picture, descriptive text, and at least one music selection. Typically, music is in the form of either a 30-second excerpt or a full song. To listen, you simply click on an icon and wait. A 30-second excerpt of compressed 8- bit monaural audio takes 2 to 4 minutes to copy to your computer’s hard drive and will produce hissy but usable sound, a few notches below the quality of AM radio. Often you can choose stereo or 16-bit sound for full CD quality (provided your computer can process 16-bit stereo), but be pre pared to wait 15 minutes to half an hour, or longer, before you hear any thing. The transfer time for any service depends on the overall data traffic and gateways, the quality of your local phone line, and your modem speed and computer configuration. What makes alternative music on the Internet so appealing is that you choose what you want to listen to rather than being limited to what a big record company or record store thinks you want to hear, and you can check out new recordings before you buy. If a group has a CD or cassette available, you can order it and even find out how to book the band for your club. Of course, not all the music deserves a wide hearing, but the next act is only a click away. Big record companies, in their Web pages and on the commercial online services, usually offer photos, tour schedules, and music samples, often from forthcoming albums. Forums, whether offered by a ser vice or an Internet “newsgroup,” may incorporate music discussions in the form of messages posted on an electronic bulletin board. Forums range from broad topics (rock-and-roll or jazz) to specific composers (Stephen Sondheim). Popular forums may grow by several hundred messages a day, others by only a few a week. Most forums are not moderated; that is, no one edits the messages or checks them for accuracy. Such raw information runs the gamut from the absorbing to the silly. Strongly worded arguments and insults (“flaming”) are common, in part because the various participants never see each other. With rare exceptions, forums contain only text without graphics or sound. Several magazines have set up on line sites. Stereo Review, for example, is on AOL (keyword: stereo), with highlights from recent issues, re views, and a forum. Dozens of small- scale electronic music publications (“e-zines”) have also popped up on the Internet and the commercial services. Addicted to Noise (www.addict.com/ ATN) is billed as the Internet’s first rock-and-roll magazine, offering celebrity interviews, a daily “Music News of the World” column, and a CD ordering service. RealAudio is an ambitious project that turns the Internet into an audio feed — a private radio station (www. realaudio.com). You can select from many audio programs. Missed a report from yesterday’s All Things Considered? Click on the NPR (National Public Radio) button, browse the topics covered in the past week, click, and listen. Again, the 8-bit sound is poorer than that of AM radio but is nevertheless adequate for speech; the standard modems available today simply cannot deliver real-time music with listenable quality. Better-quality audio feeds and faster online response times require faster telecommunications on many different levels. On the last leg, from your computer to the phone network, ISDN (Integrated Services Digital Network) phone lines support 64- or 128-kilobit- per-second connections, two to four times faster than the fastest modems. Although an ISDN line can’t support a high-quality audio feed, it can support a modest-quality real-time video feed. In the future, when fiber-optic cables are universal, a 1.5-megabit-per- second phone line will be able to deliver CD-quality audio and pretty decent real-time video. You’ll be able to select and mix music to your own tastes — provided, of course, that the problems of copyright law and fair compensation can be solved.